Warwickshire teenager Max Martin pulled off his biggest win to date with a wire-to-wire victory in the Welsh Open Youths’ Championship at Prestatyn. Martin, who was an England boy international in his junior days, was eight-under par for the 72-hole tournament and won by a stroke from Thomas Williams of Wales. He set up his success in the first round with a bogey-free eight-under par 64, when he played super-accurate golf. He hit into 2ft on the first to get on the birdie train and was six-under at the turn, never having to hole anything longer than 13ft. However, Martin rated his third round 69 as even better quality, played in “brutal” windy conditions. He was 13-under going into the final round, and played conservatively over the closing holes as he headed home in the strong wind. “I didn’t want to make any silly mistakes, I just wanted to get the job done,” he said. 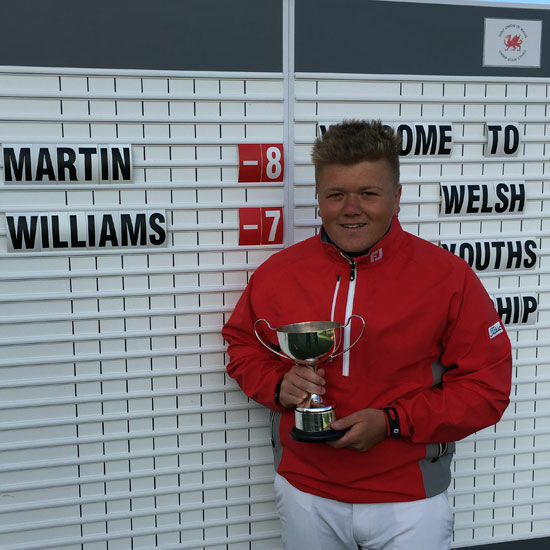 Earlier this season Martin had a top ten finish at the South East of England Links championship and a top 20 at the Welsh open stroke play. Click here for full scores from the Welsh Youths.